I thought you'd appreciate a follow-up to last week's post about 4-year-old Cody Brasich. Sadly, little Cody passed away this past weekend while in Hospice care, with his mom and dad by his side. 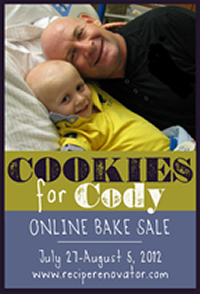 Hundreds of people, including many of you reading this, placed generous bids on the online bake sale and made direct donations to codybrasich.com. So far, over $11, 000 has been raised to help Cody's parents with their exorbitant medical bills. Thank you for donating, spreading the word, and keeping the family in your thoughts and prayers.